Hello my lovelies and happy weekend! Hope your Saturday is going great! Today I have something really amazing to show you! These are some stamping plates I've recently purchased from Fab Ur Nails Shop. They are amazing indie plates and you won't find these designs anywhere else because they are original and unique. Honestly these are the most interesting plates I own. They are two medium sized plates and it's not a coincidence that they are named FUN. In this picture you can see my whole order from the shop. I also got the F2 fauxnad plate which is also great. You can find that one on ebay also but I think Fab Ur Nails has the best price for it. The FUN plates you can only find in this shop though. They all come with a plastic wrap that can be easily peeled off to reveal a nice shiny surface. They also have a nice backing with the Fab Ur Nails logo. The full-nail designs on these plates are very big. I have a regular-sized Konad stamper and they are too long to fit it. That's why my swatches don't show the whole image. These are perfect if you have really large nail beds and long nails. Just make sure you get an XL stamper and you won't have to double stamp anymore. I swatched FUN 1 using China Glaze Liquid Leather (black) and FUN 2 using China Glaze Awaken (metallic charcoal). My swatches of FUN 2 are very messy and I apologize because I did them in a hurry this morning. Keep in mind that using Konad special stamping polish always works better for stamping. But these plates work very well even with regular polish. I think that's about it. Let's see the swatches now! 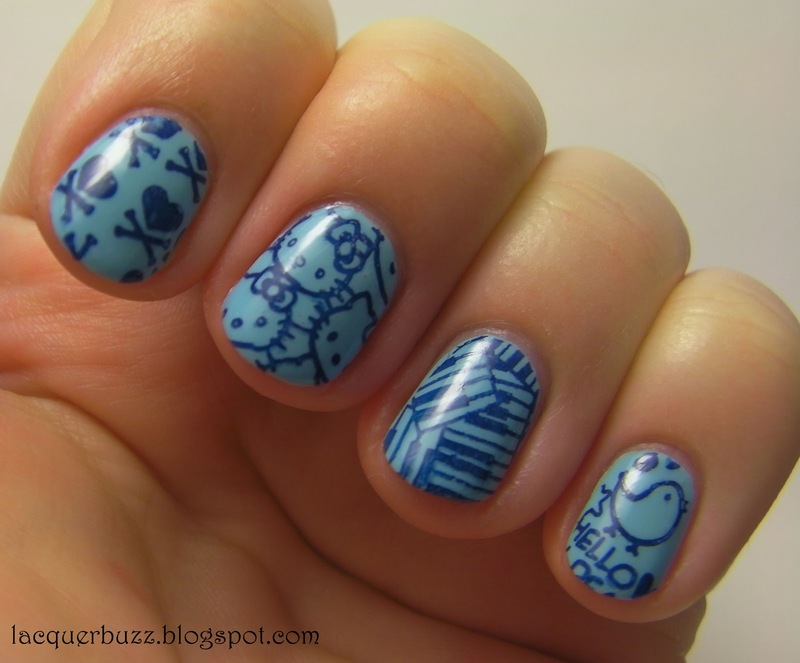 I really love the full-nail designs on this plate, especially the piano one. The small ones are also very cute. 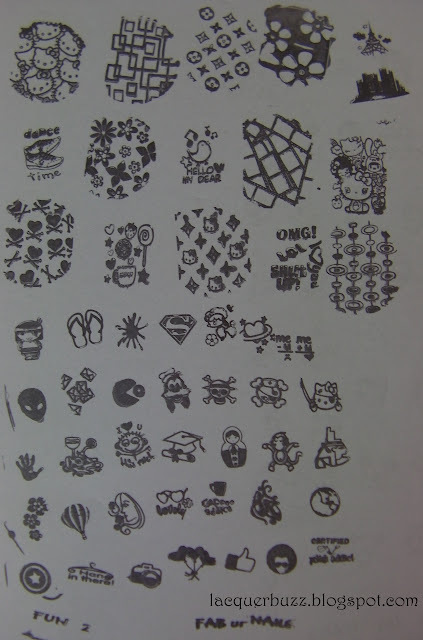 Angry Birds, Plants versus Zombies, South Park, Bart Simpsons and so much more! You can't beat that! This plate is my favorite because of the many full-nail designs. I love the flower ones and the Hello Kitty in the top left corner. I really couldn't choose between these two plates so I had to get them both! And of course I had to try them as soon as they arrived! 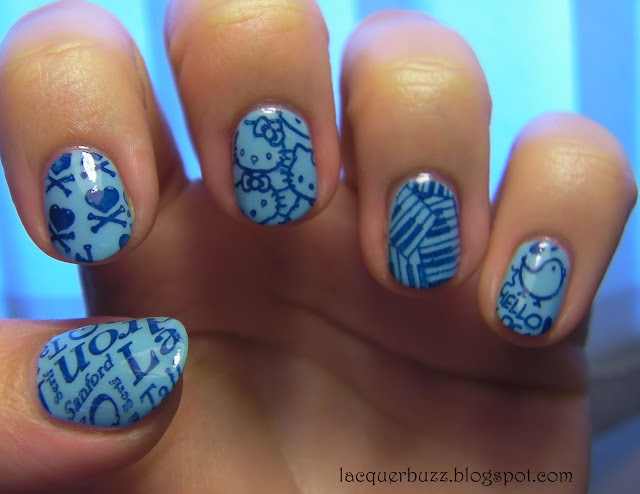 So I stamped some of them on my blue-colored previous mani (review coming soon) using China Glaze First Mate. 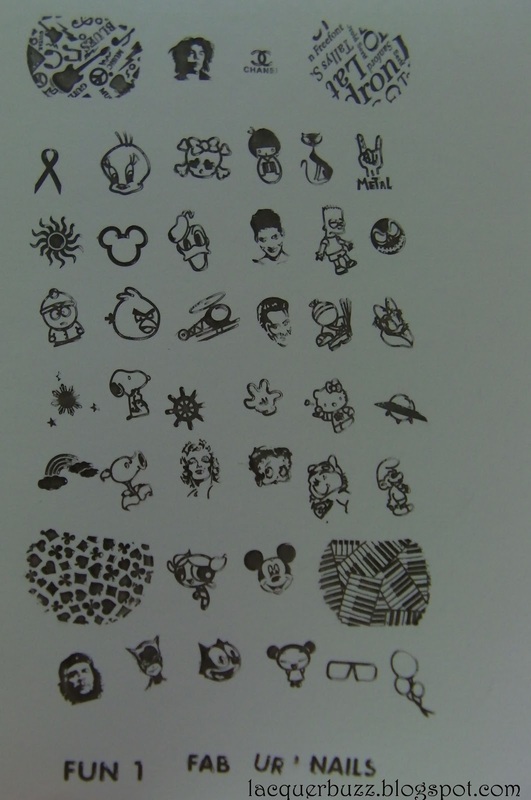 Too bad I had nubs at the time and couldn't fit more of the designs on them. Now let me tell you a little bit about the shop. You can find them on Facebook here or on this blog. 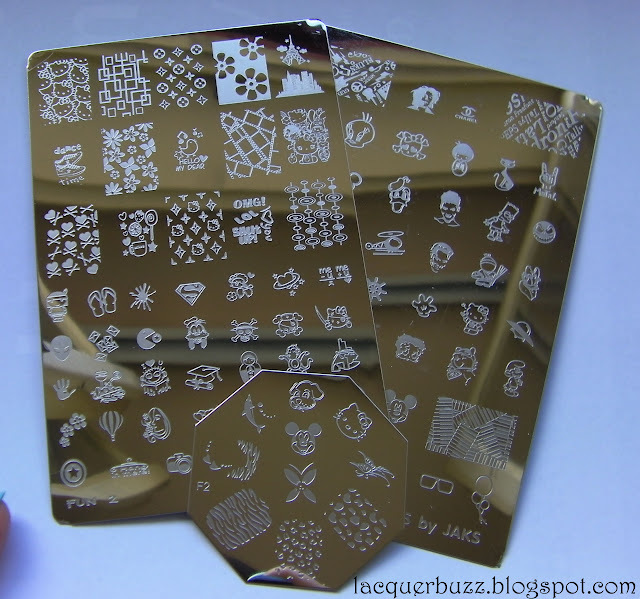 They also sell other plates and stamping polishes. They ship internationally and the rates are ok. The customer service is amazing! Johanne, who runs the shop, is very sweet and answers every question you have. She is willing to replace your product if it gets damaged during shipping. And all this because she is a nail enthusiast and blogger like us. She is not just a business woman. She really loves what she does and that's why I trust her 100%. My experience with this shop was a great one and I highly recommend it to everybody! 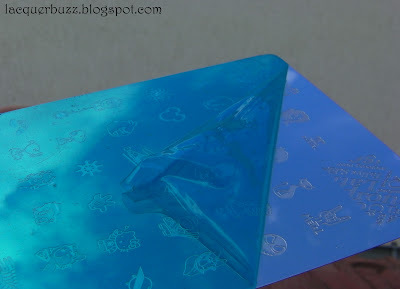 I've seen more swatches of the designs which weren't as great as yours are, and the problem seemed to be that the engraving wasn't deep enough... So I don't know if I should take the risk or not? Mine are pretty deep I suppose. I don't have hundreds of plates like other girls do, but I've had my share of bad ones. These are ok. And Johanne is always willing to replace them if you have any trouble with the stamping. I couldnt find this seller on ebay...can you tell paste the link for the page? I would love to have this. Only the F2 can be found on ebay (the small one in the first picture). The FUN plates can be found here: https://www.facebook.com/faburnails or here: http://thriszha.blogspot.com/2012/01/hello-cutee.html .If you add them on Facebook you can send them a message to ask anything and they will reply very fast. Johanne, who runs the shop, is very sweet and helpful! I was wondering if you could note how long the shipping took? I ordered the FUN plates and a few others and while I found the shipping to be reasonable, it seems to be taking longer than it should. I did a huge EBay haul (mostly stuff from Hong Kong) the day before and all of that has arrived already.